Don't forget that there's another indie comic book adaptation coming up next month called RED, based on Warren Ellis' WildStorm comic book series. We've featured numerous trailers and the official poster for the upcoming action comedy starring one hell of a cast: Bruce Willis, Morgan Freeman, John Malkovich, Helen Mirren, Karl Urban and Mary-Louise Parker. 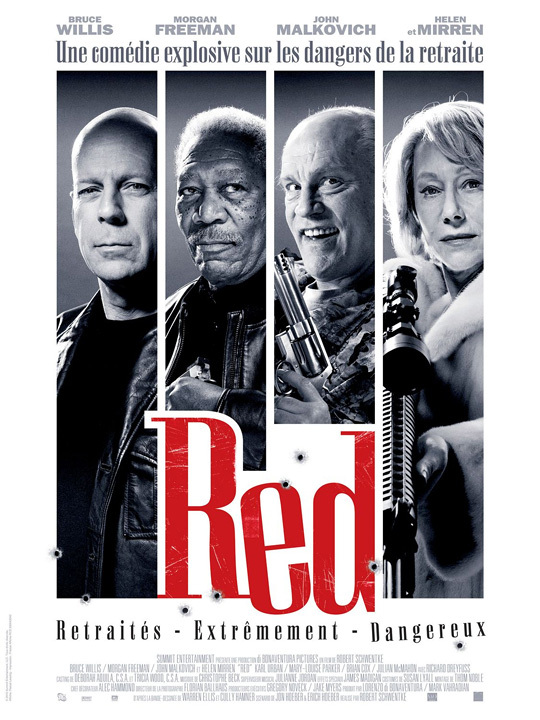 IMPAwards recently found a brand new French poster for RED that is actually quite gorgeous. I love the simplistic, sleek old school design and I love the "quadtych" design with the four main characters. Not that it makes me want to see this any more, but it is a damn good poster. When his idyllic life is threatened by a high-tech assassin, former black-ops agent Frank Moses (as played by Bruce Willis) reassembles his old team in a last ditch effort to survive. Based on the Wildstorm comic. RED is directed by German filmmaker Robert Schwentke, of Tattoo, The Family Jewels, Flightplan and The Time Traveler's Wife previously. The screenplay was written by brothers Erich and Jon Hoeber, of Whiteout previously as well as the upcoming Battleship and Alice. This is based on the Warren Ellis comic book series first published by WildStorm in 2003. Summit is bringing Red to theaters on October 15th later this year. Shouldn't it be 'rouge' instead? Soooo much better than that "red" one (no pun intended). Malkovitch, man. I don't like it at all. And is it just me or Helen Mirren looks weird as hell holding that weapon?! When Alex says this doesn't make him want to see it anymore does that mean he still doesn't want to see it or he wants to see it so much, it can't make him want to see it more than he does already? I'm in just on the actors. I'm more of a Willis fan than the average movie goer (at least his action ones: Tears of the Sun-underrated, The Color of Night-DUMB!) and Freeman, Malkovich and Mirren never hurt a movie. I think "gorgeous" is a bit of an overstatement. Malkovich look's nuts....this could be a great movie. In what way is that gorgeous? Why the hell isn't Karl Urban appearing in all advertising? He might not have the 60 year career behind him (yet) like the others, but he is sure as hell way hotter than all of them and Brad Pitt, George Clooney and anyone else for that matter! it's got a good look that poster.